So I finally made it to Dabbous, after waiting six long weeks for my midweek lunch booking to roll round (a weekend slot would have doubled the wait). This is undisputedly the hottest table in town, and recent favourable press has skyrocketed demand further, with rumours that one would be lucky to land a seat before the summer. Chef Ollie Dabbous’ CV is impressive (Le Manoir aux Quat’Saisons, Mugaritz, Hibiscus and Texture), but it is his inventive modern European food and not his credentials that has sent the crowds flocking. First impressions were good – the minimalist industrial decor, affable waiters and bustling room filled with an eclectic mix of hipsters, business folk, ladies-who-lunch and magazine editors immediately set me at ease. The 7 course tasting menu (reasonably priced at £49) read well but M and I opted for the à la carte to afford ourselves a wider choice. M and I ordered 13 plates between us (we were advised to order 5-7 dishes each) before catching up over the seeded bread (presented in a date-stamped paper bag) and olives set on the table. 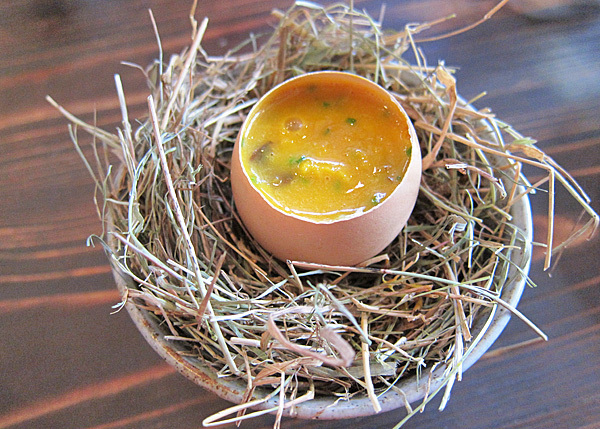 We both started with the Coddled Free Range Egg with Woodland Mushrooms and Smoked Butter – a silken chive-speckled egg and mushroom mixture with distinct smokiness. Definitely tasty, it awakened my appetite and left me wanting more (at £7 a pop, many may expect more). 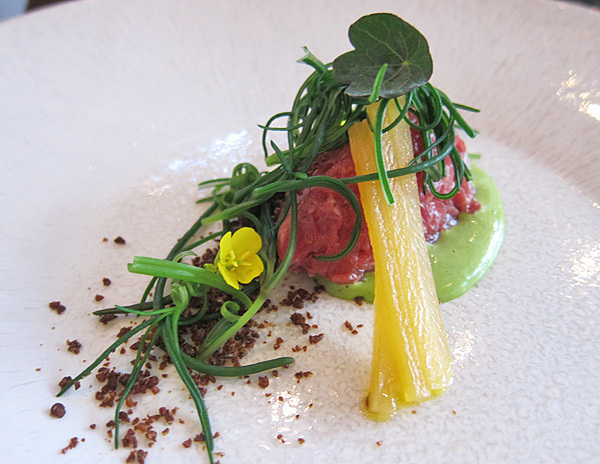 Beef Tartare with Cigar Oil, Whisky and Rye served with Monk’s Beard was a nice light dish that melded well but didn’t excite as much as anticipated, the flavours being a little too restrained. 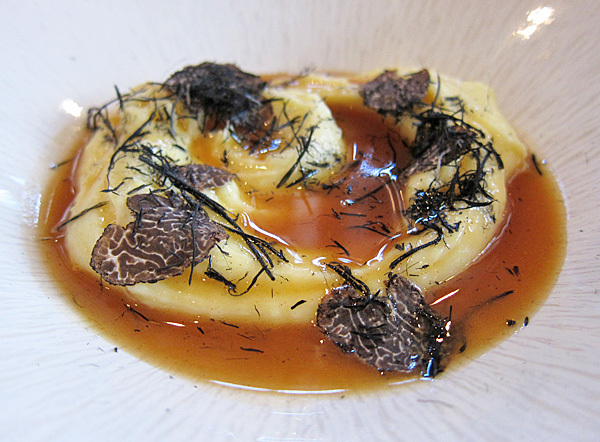 In contrast, the Mash, Roasting Juices with Black Truffle was a massive hit with us both – velvety potatoes with an intense poultry jus, earthy truffle slivers and the inspired addition of hay ash. A humble dish brought to new heights. 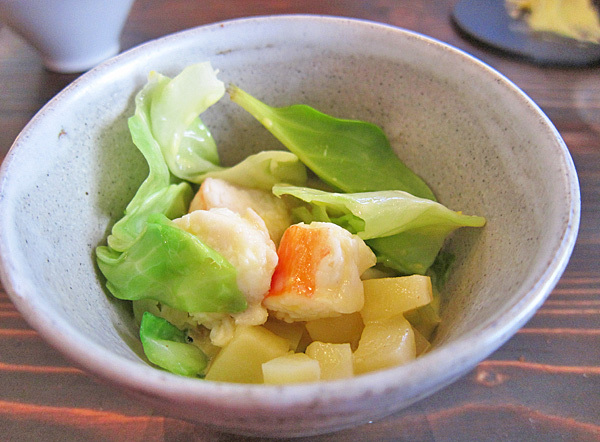 Roast King Crab and Hispi Cabbage was also hugely enjoyable with an addictive creamy warm buttermilk dressing, but I longed for more of the sweet shellfish morsels. King Crab may be a luxury ingredient but £12 is a little steep for 4 small chunks, especially when one can get several whole Wild Norwegian King Crab Legs for just over double that at One-O-One. The succulent Roast Goose with Sweet Clover Kuzu and Quince poached in Wine and Honey, at the same price, was more appropriately portioned and quite delicious. 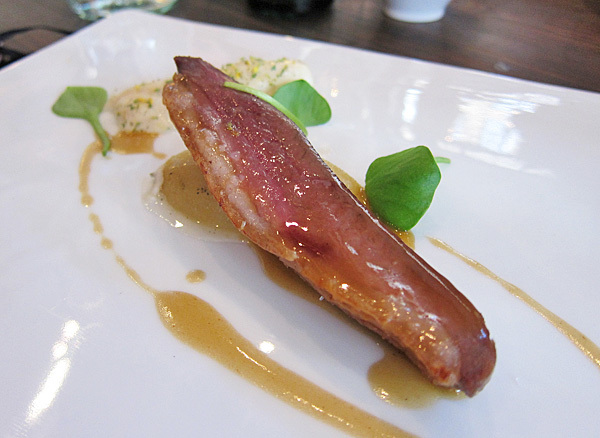 The sweet clover kuzu (a Japanese starch) was an intriguing take on bread sauce and offset the savoury meat and sticky wine and honey poached fruit splendidly. 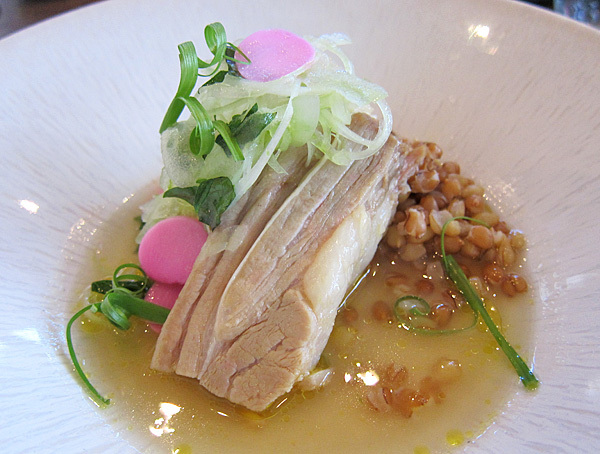 Braised Veal Breast, Toasted Wheat, Celery and Lime packed but was uplifted by the crisp celery slivers and sharp pickled garlic. Competing with the goose for my affection was a slab of Barbecued Iberico Pork served with Savoury Acorn Praline, Turnip Tops and homemade Apple Vinegar. 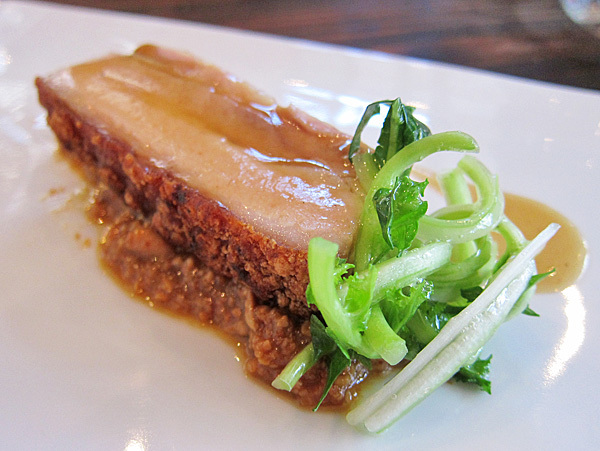 It sang of Asian flavours – the meat with its crunchy crackling was akin to Cantonese roast pork, and the praline reminiscent of a chunky peanut satay sauce. The acid and sprightly greens provided balance to the otherwise rich plate. 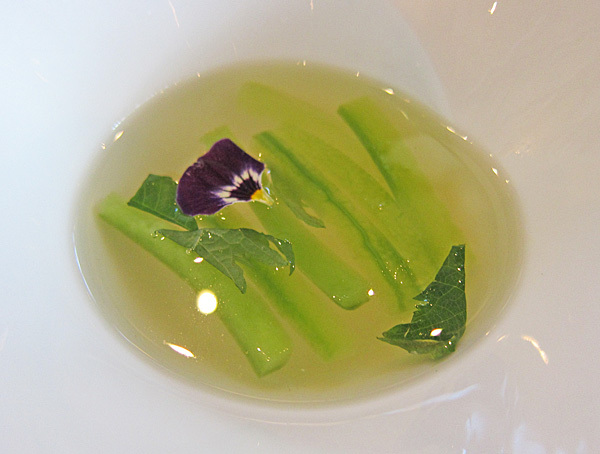 Cucumber and Perilla in a chilled Lemon Verbena Infusion was delicate, refreshing and refined in its simplicity – a perfect palate cleanser. The much-talked-about Barley Flour Cake soaked in Red Tea with Tahitian Vanilla Cream was lovely. 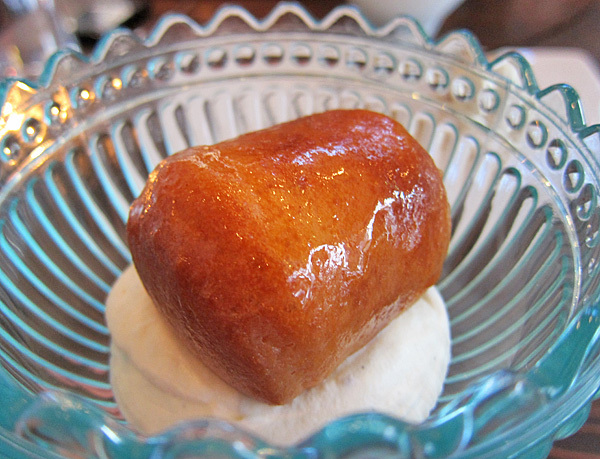 A non-alcoholic rendition of a rum baba, it was light and moist, its sweetness tempered by the softly whipped cream. 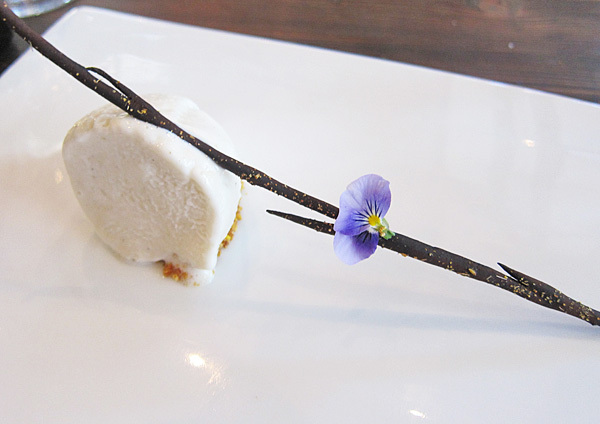 I wasn’t as enamoured with the Camomile, Vanilla and Manuka Honey Ice Cream with Crushed Bee Pollen which was aggressively floral for my taste. Being a sucker for a good Canelé I was thrilled by the complimentary ones at the end of the meal. The custardy cake encased in a crusty, caramelly shell is one of my favourite things to eat and the one at Dabbous was very good indeed. Unfortunately the glazed cherries, pretty as they were, were too sweet and acted as a distraction rather than compliment to the petits four. While certain dishes still need fine-tuning, I came away from lunch impressed by the intelligence and creativity of Ollie’s cooking. I found the staff incredibly friendly and they took pains to describe the dishes in great detail, although some were less well-versed than others. My biggest quibble however is with the inconsistent pricing; I suspect others will feel the same. 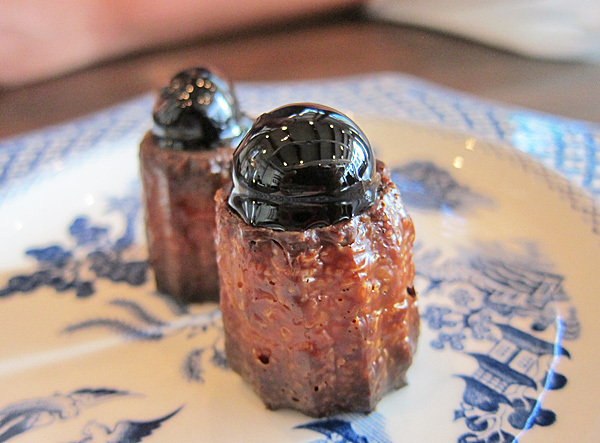 ~ by gourmettraveller on March 15, 2012. Uh….. right, so if I book now…. I can eat in July perhaps? A friend tried to book for dinner recently and they are taking reservations for August! It’s good, but maybe not that good! Great write-up.